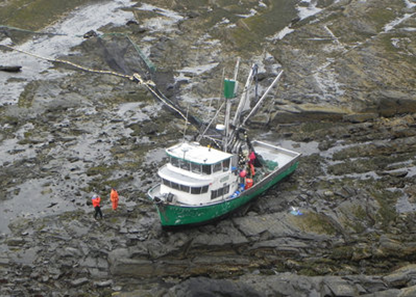 The 48 foot fishing vessel Sisiutl went aground in Portage Bay off Shelikof Strait, Alaska. The vessel with 3 crew on board and 600 gallons of diesel was taking on water and developing a list. The fishign vessel Invincible reported the Sisiutl aground to the Coast Guard. The Coast Guard responded sending out a HC-130 Hercules and HH-65 Dolphin helicopter. The Hercules dropped a pump to the Sisiutl and a second pump was delivered by the Dolphin. With pumps on board, the vessel was able to refloat itself. The crew moved the vessel to Kantak Lagoon where they beached it to complete temporary repairs. The Sisiutl will be towed back to Kodiak. No reports of injuries or pollution released. Authorities will investigate the incident. The 54 meter long tanker Nandayou 22 exploded while docked at Guangzhou, China. Reports state that five people were killed with one injured. Authorities were able to extinguish the fire started by the explosion. The number of people on board the Nandayou 22 before the explosion was not known.